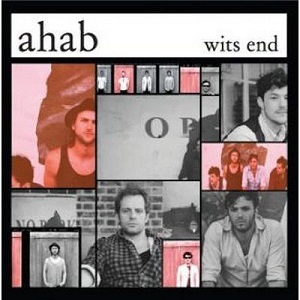 ahab are a British band with a very American sound. After releasing their debut CD (a.h.a.b) they spent two months playing a residency at Tootsie's Orchid lounge in Nashville. During this time they changed from a duo to a four-piece which coupled with their time in the US obviously had a big effect on their sound. This album, 'wits end' is a compilation of songs from the band's two EPs - 'No king' (2010) and 'KMVT' (2011), which gives many people the chance to hear these songs for the first time. It's a hard sound to describe - at first I was going to call it country, but then as I listened further, rock seemed more appropriate, but after listening to the whole album I think "alt country" is the best description for them. It's a sound that mixes country and rock and the end result is extremely listenable. The album opens with 'Wish you'. It's quite a fast paced song and it gets the album off to a great start. 'Lightnin bug' is one of my favourite songs on the album. The country element is quite strong in this one but there's also a rock element to it as well. It's a great album - the mix of country and other sounds works really well and it's an album that will appeal to alt-country fans, and fans of country and of rock are also likely to find something here that they'll enjoy. 'Wits end' is out now on Navigator records. 11. Where's the one you love?